WARNING!! SPOILERS FOR THE FIVE BELOW!!!!! Hi, guys! Hope all is well and your summer has been good. I’ve been getting some interesting reviews and comments about The Five. Thanks to everyone who’s bought the book and read it, and thank you for voicing your thoughts. I see many, if not most, reviews compare The Five to MINE and say that it is a crime/thriller without any supernatural content. Why did Gunny suddenly appear when Jeremy has finally decided to commit suicide? Do you think there’s any reason that Jeremy’s last name is “Pett”? How do you think the video was manipulated? Who was the girl at the well? Any symbolism in the crows circling the field? What was the thing that George has seen in the hospital room? The black “origami”? What is the reason the story of Stone Church is in the book? There is one. A BIG reason. Why is it that Jeremy wants to give up the “hunt” at some point and Gunny brings him back on track? What is the meaning of Ariel’s dream of the figure in the field belching out crows? What is Connor Addison’s role? Why was he there to shoot one of the band members? What is DJ Talk It Up’s role? Why is he there to…you know what. 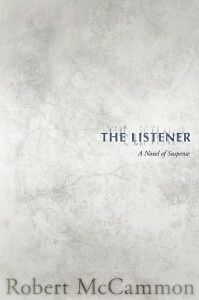 What is the meaning of the rock opera that Eric Gherosimini is writing? It’s called “Ground Zero”. And…crucial here…Gherosimini says it’s about “the war”. What war is he talking about? Let’s speculate and say that Gunny is a demonic figure who wants to use Jeremy to stop THE FIVE from writing the song. Why? What’s in the song that merits that sort of attention? The clue here is who the song speaks to. Consider True’s thoughts about Stone Church, and how the reappearance of those people—those souls stolen by Hell—would change the theological balance of the world. Consider that Jeremy knows he is bound to Hell for what he has done. But…maybe a Marine with a family to get back to, much like the situation in his favorite movie Gladiator, is enough to make him find those lost souls, and say to them…”Follow me” to a way back to the world? And consider who the song goes to. I will tell you that the girl at the well is an angel in human form. Remember that she was the last to take a drink of water, after serving everyone else. Remember that the girl to whom the song means so much was nearly the last one into the club, and she almost sacrificed her place in by helping someone else get in before her. She is, indeed, on her way to becoming an angelic figure…to use her music for the power of good…and THAT is why Gunny the demonic figure wanted to stop the song from being written and reaching her. Love the book first of all. So many aspects came into play, I even thought that the reaction to the cheese brought the 5 to the girl @ the well because of Nomad’s internal struggles and that his allergic reaction to dairy was important to the story but I could be reading WAY too mich into things. I especially loved the ending, and again Nomad and his knee jerk reaction to most situations but of course he has to ask why. Why would our friends be dead, why would all of this happen? Jenn was (LOVE the Waylon bit) the perfect ending. I had goosebumps while reading it. Many of us are good, but maybe we can all be just a little bit better? I put this book down thinking about Jenn going off and winning her own internal battle and making music to help save the world. Thank you as always for the journey. I do think “The Five” bears comparison to “Mine,” because it can be enjoyed on a straight hunter-prey level. However, the supernatural aspects are too obvious to ignore, and readers who choose to disregard them are missing out on the fullness of the story. For me, the novel came down to a simple battle between good (the girl at the well) and evil forces. Gunny, the spiritual manifestation of Evil, wanted to stop The Five from writing a song that would inspire Hope and encourage others. And not just Hope to one or even a few individuals, but a Hope that would increase exponentially by inspiring another songwriter to continue the message. I have a relationship to movies the way you do to music, so I often found myself thinking of movies that affected me the way music affected the characters in “The Five,” and the Hope and encouragement I’ve found in certain films. I can’t tell you how thrilled I was a few years ago when I heard that Robert McCammon was returning to writing with the Matthew Corbett character. I can’t wait to read more of his exploits! What Derek Said! Right On. That was exactly my take on THE FIVE. I’m really surprised that people have missed the point – I thought the final section of the book made it abundantly clear what was going on. It’s one of the strengths, and indeed something that I headlined in the incredibly brief description of the book at the head of the review… ! Paul’s review can be found at scifibulletin.com. I thought the supernatural element elevated the story from a simple crime thriller to something worthy of Robert’s hand. Mine was a fun read and to be honest I liked it better than Boys Life. But the demon possible and sub reality world brouht up my hackles. In the same way King elevated The Shining from a simple slasher story. The crows for me were symbolic of death, the obvious but also the vernacular of old for those that traditionally did field work. The contemporary farm workers lost souls toiling in the brambles locked forever with the angel giving them a drop of water. The duality of time brilliantly done. I wrote on my blog a non spoiler version of this. In a nut shell the subtle nature of the supernatural evil is what places this work above most of the genre! I also agree with Derek, and really really hope there is another Matthew Corbett story on the way!! Just a couple of weeks ago, Mr. McCammon finished The Providence Rider, the next book in the Matthew Corbett series. It should see publication sometime in 2012. I believe the novel is Robert’s answer to the questions! I can see the Stone Church and similar places having their darkness ripple through the McCammonverse. Loved the final section of the novel, and the hope, inspiration and creativity that was being unfurled. Since you know the answers to all the questions Robert posed please tell me why Jeremy’s last name is Pett. All I can say is…wow. Well, maybe that’s not all I can say. I can also say that someone who, however benignly, says that The Five contains no supernatural elements has to be willfully obtuse. True, there are no floating sheets swooping down from the rafters and saying “BOOO!” I guess some readers need to be spoon-fed their supernatural elements. I’m sorry, I know I’m coming off as pretentious and looking down on those readers. I truly don’t think less of them, and I hate coming off as one of those weirdo readers who denounces those who “just don’t understand the genius” of their favorite writer. I’m definitely not one of those whacky folks (though McCammon is my favorite, truth be told, having recently supplanted Michael Chabon). My harsh tone here is merely the result of being baffled that someone can’t see what’s right in front of their faces. It’s not even as though they have to read between the lines. Just read THE ACTUAL LINES and a reader will see that once the novel gets going, the supernatural element is the track on which this roller coaster rides, baby. Anyway, just wanted to add that the final scene in which Jeremy expires is a gorgeous goddamn tapestry of words and images. Just jaw-droppingly beautiful. From the questions posed, I see that it’s time for a reread (first read was sitting on a balcony on Bourbon street. . .a second reread is needed for many reasons *lol*) because I can’t answer them all. Symbolism isn’t something I search for; I like straight up, entertaining, captivating reads and that’s what keeps me coming back to Robert’s books. Where some say it reminds them of Mine, for me it recalled Swan Song. First off — GREAT novel. I settled in for a crime-thriller framed by the story of a band’s last days, and was treated to so much more. 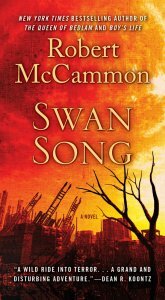 Of course, I should have expected a McCammon novel to shatter the expectations set by the book-flap description — but the direction that this novel takes in the second half, the way the “meaning of it all” is revealed, really just blew me away. I’m not a fan of overt, heavy-handed spirituality in fiction. You could say that I’m a heretic, even. But I absolutely believe in the power of music to reach people and inspire them (toward goodness, or maybe even the opposite). I appreciate the way McCammon explored these themes in The Five. In the context of the story, I found it entirely believable. 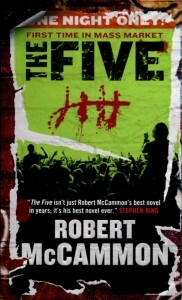 Have read all McCammon’s books so far, and just tried to read “The Five.” Most unappealing characters ever found in a book, and the story itself was just boring and uninteresting. About half-way through, I had to give it up, as I did “Mr. Slaughter.” Neither that book or “The Five” was a good read, imo, and I’m really diappointed. Loved “The Queen of Bedlam,” “Boy’s Life” (wonderful! ), “Gone South,” and “Speaks the Nightbird.” So surprised that “The Five” was such a big let-down. 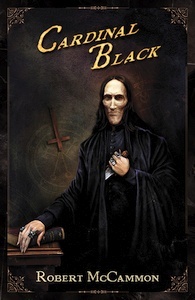 Another short story reprint Subterranean Press: The Providence Rider Is Coming in 2012!